Editor’s note: We here at APB aren’t doctors, but this reader-submitted post from Reddit seems pretty legit and more than relevant, considering the extreme temperatures in some parts of the country. If it is over 98 degrees, you must sweat to keep your body functioning. 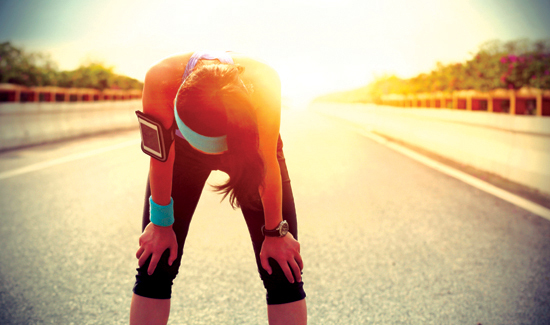 If the sweat cannot evaporate faster than it is produced due to humidity, you must reduce your exertion until it cools off, or you will suffer heatstroke. This is not something that you can ignore because you are a tough guy. A good coping strategy is to work in the morning, take a nap during the heat of the day, then work in the evening. Let’s talk hydration. You need two things to work effectively in hot weather: water and salt. Sports drinks like Gatorade are great because they combine both. A good rule of thumb is to take a hydration break and drink your fill every hour over 80 degrees, every half-hour over 90, and every 15 minutes over 100. In extreme dry heat, you should be targeting about a gallon per hour of a drink containing electrolytes (salt). It is extremely important that you get enough salt—you lose it when sweating! Response: ER doc here. This is a great post. One little correction: Heat exhaustion vs. heat stroke is an important distinction here. Heat exhaustion is heavy sweating, but the body’s cooling systems are in overdrive. Nausea/vomiting (which accelerates the dehydration), fainting (or near fainting), and fast pulse are noted. Heat stroke is when the cooling system has failed entirely. This is when sweating stops. Now, since there is no more evaporative cooling, body temp rises rapidly. This is where major organ damage/multi-system organ failure is a real possibility. Why? Your body is made of proteins. When the temp gets too high, those proteins unravel and stop working. Best way to fix this? Honestly, in the ER, we do misting and fans. The goal is to coat the person in a fine layer of water and then blow air over it to make it evaporate. Evaporation takes away heat. In extreme cases, we dunk them in an ice water bath, but the misting/fans method is preferred if time allows. Having misters on site where people are doing manual labor is a good idea.